Archimandrite Sophrony (Sakharov), also Elder Sophrony, was best known as the disciple and biographer of St Silouan the Athonite and compiler of St Silouan's works, and as the founder of the Patriarchal Stavropegic Monastery of St. John the Baptist in Tolleshunt Knights, Maldon, Essex, England. On September 23, 1896, Sergei Symeonovich Sakharov was born to Orthodox parents in Russia. As a child, Sergei would pray daily, later recalling that he would pray for 45 minutes without stress. Even as a child, Sergei experienced the Uncreated Light. He read widely, including such Russian greats as Gogol, Turgenev, Tolstoy, Dostoyevsky and Pushkin. Due to great artistic talent, Sergei studied at the Academy of Arts between 1915 and 1917 and then at the Moscow School of Painting, Sculpture and Architecture between 1920 and 1921. Sergei used art as a "quasi-mystical" means "to discover eternal beauty", "breaking through present reality...into new horizons of being." Later, this would help him to differentiate between human intellectual light and God's Uncreated Light. It was around the time of his study at the Moscow School that Sergei would see Christianity's focus on personal love as being necessarily finite; he fell away from the Orthodoxy of his youth and delved into Indian mystical religions based on the impersonal Absolute. In 1921, Sergei left Russia, partly to continue his artistic career in Western Europe, and partly because he was not a Marxist. After first going to Italy, he went to Berlin, and then settled in Paris in 1922. Sergei's 1922 arrival in Paris lent itself to artistic exhibitions of Sergei's works, which attracted the attention of the French media. However, he was growing increasingly frustrated by the inability of art to express purity, and however much he tried he couldn't escape this reality. He also grew to see that rational knowledge was entirely unable to provide an answer to the problem of death. In 1924, Sergei came to the realization that Christ's precept to love God with all of one's being was not merely a psychological thing, but ontological; that this total love was the only way to relate to God; and that love had to be a personal thing by definitional necessity. On Holy and Great Saturday of that year, he returned to Christianity. He experienced the Uncreated Light in a strength unmatched to the end of his life and, as a result, distanced himself from his artwork. Sergei then became among the first students of the St. Sergius Orthodox Theological Institute in Paris. He was lectured by Fr Sergius Bulgakov and Nicholas Berdyaev, but while both influenced Sergei, problems with each (Bulgakov's sophiology and Berdyaev's anti-asceticism) limited the influence they had on the future Elder. In 1925, finding formal theological study to be inherently unfulfilling, Sergei left the Institute and Paris to become a monk on Mount Athos. Sergei arrived at Mt Athos in 1926, where he entered the Russian Orthodox Monastery of St. Panteleimon with the intent of learning how to pray and to have the right attitude towards God. He was tonsured with the name of Sophrony. In 1930, Fr Sophrony was ordained to the diaconate by St Nicolai (Velimirovic) of Zicha, and he became a disciple of St Silouan the Athonite, who would prove to be Fr Sophrony's greatest and life-long influence. St Silouan had no formal system of theology, being largely uneducated, but his life exuded theology. This is what taught Fr Sophrony, and what Fr Sophrony would later systematize. Between 1932 and 1946, Fr Sophrony exchanged letters with Fr David Balfour, a Catholic who converted to Orthodoxy. These letters revealed Fr Sophrony's knowledge of many Fathers of the Church, and they forced Fr Sophrony to articulate his theological thought and to demonstrate the differences between Western and Eastern thought. Many of Fr Sophrony's later thoughts would arise out of the same topics addressed in this correspondence. In 1938, St Silouan September 24 reposed. Following the saint's instructions, Fr Sophrony left the monastery grounds to reside in the Athonite desert: first at Karoulia, then at a cave near St Paul's Monastery. His residence in this desert lasted World War II's duration, 1939-1945, and it proved to be a time of such intense prayer that Fr Sophrony's health was affected. This taught him the interdependence of all humanity. In 1941, Elder Sophrony was ordained to the priesthood. He became a spiritual father to many Athonite monks. There are a number of possible reasons as to why Elder Sophrony left Mt Athos. It may have been due to his deteriorating health, or to publish St Silouan's works, or to complete his theological education; it may simply have been due to the problems of being a non-Greek on Mt Athos after the close of World War II. Nonetheless, Elder Sophrony felt compelled to move to Paris, where Balfour helped him gain a passport. The faculty of St Sergius Institute allowed Elder Sophrony to sit the examinations of the whole course and provided for his needs; however, upon his arrival, the faculty insisted that Elder Sophrony deny, by silence, the grace present in the Moscow Patriarchate. Elder Sophrony refused to do so and therefore did not reenter the Institute. Elder Sophrony settled in Russian House, an old-age home, in St Genevieve-des-Bois, where he assisted the local priest and acted as the father confessor. He had a major operation on a stomach ulcer. The next year, Elder Sophrony produced the first mimeographed edition of Staretz Silouan on hand-roneo. Within this text, Elder Sophrony outlines St Silouan's principles of theology, and he explains many fundamental concepts, among them prayer for the whole world, God-forsakenness and the idea of all humanity being interconnected. 1950 sees Elder Sophrony working with Vladimir Lossky on the Messager de l’Exarchat du Patriarche Russe en Europe Occidentale, which he did until 1957. Lossky influenced Elder Sophrony's thought on many contemporary issues while complementing Elder Sophrony's work on Trinitarian thought and its application to the Church and humanity; however, Lossky would not talk about a deified human nature, nor about the idea of God-forsakenness in a positive view, as Elder Sophrony did. In 1952, Elder Sophrony produced a second edition, professionally done, of Staretz Silouan, bringing much fame to both St Silouan and Elder Sophrony. Based on Lossky's criticism that he could find no theological value in the saint's works, Elder Sophrony included a theological introduction to St Silouan's writings. By 1958, Elder Sophrony had a number of people living near him, seeking the monastic life. A property at Tolleshunt Knights, Maldon, Essex, England was inspected, and the next year the Community of St John the Baptist was formed at this site, under the omophorion of Metropolitan Anthony (Bloom) of Sourozh. The monastery had both monks and nuns, something that has continued to the present, and originally had six members. In 1965, the monastery would move under the omophorion of the Ecumenical Patriarchate, adding the title 'Patriarchal' to its name. Later, the Ecumenical Patriarchate elevated the monastery to 'Stavropegic'. In 1973, a more complete translation of the life of St Silouan, under the title Monk of Mt Athos, was published, followed by the publication of Wisdom of Mt Athos, the writings of St Silouan. Elder Sophrony seemed to move to his own works after this, publishing His Life is Mine in 1977 and We Shall see Him As He Is in 1985. This last book, a very frank, open spiritual autobiography, was published to mixed reviews: where the West generally enjoyed the book, the Russians generally criticized it. Some of the criticism was so stinging that it, along with increasing illness, discouraged Elder Sophrony from writing again. In 1987, the Ecumenical Patriarchate glorified St Silouan the Athonite, no doubt assisted by his fame from Elder Sophrony's works. The monastery had been informed that the only way that it could bury people on its property was to build an underground crypt, which it proceeded to build, and to which Elder Sophrony said that he would not repose until the crypt was ready. Then, having been told of the expected completion date of July 12, Elder Sophrony stated that he "would be ready". On the 11th, Elder Sophrony reposed; and on the 14th was his funeral and burial, attended by monastics from around the world. At the time of Fr Sophrony's repose, there are 25 monastics in the monastery, a number that has remained steady since then. Mother Elizabeth, the eldest nun, reposed soon after, on the 24th. This was in accordance with Elder Sophrony's words that he would repose first, and she would repose soon after. 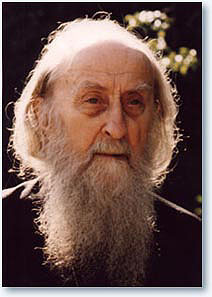 On Prayer, a book containing Elder Sophrony's writings on prayer, particularly the Jesus Prayer, was published posthumously. The Undistorted Image: Staretz Silouan, 1866-1938, 1948, 1952. Faith Press, 1958 (ISBN B0007IXVB0). The Monk of Mount Athos: Staretz Silouan 1866-1938, Mowbray, 1973 (ISBN 0264646185). St. Vladimir's Seminary Press, 1997 (ISBN 091383615X). Wisdom from Mount Athos: The Writings of Staretz Siloan 1866-1938, St. Vladimir's Seminary Press, 1975 (ISBN 0913836176). His Life is Mine, St. Vladimir's Seminary Press, 1977 (ISBN B000B9E2WW). St. Vladimir's Seminary Press, 1997 (ISBN 0913836338). We Shall See Him As He Is, 1985. Essex, England: Stravropegic Monastery of St. John the Baptist, 1988. Saint Silouan, the Athonite, St. Vladimir's Seminary Press; reprint edition, 1999 (ISBN 0881411957). On Prayer, St. Vladimir's Seminary Press, 1998 (ISBN 0-88141-194-9). Christ, Our Way and Our Life by Archimandrite Zacharias. "A Presentation of the theology of Archimandrite Sophrony." (ISBN 1-878997-74-2). I Love Therefore I Am by Nicholas V. Sakharov. St. Vladimir's Seminary Press, 2003 (ISBN 0-88141-236-8). "No one on this earth can avoid affliction; and although the afflictions which the Lord sends are not great men imagine them beyond their strength and are crushed by them. This is because they will not humble their souls and commit themselves to the will of God. But the Lord Himself guides with His grace those who are given over to God's will, and they bear all things with fortitude for the sake of God Whom they have so loved and with Whom they are glorified for ever. It is impossible to escape tribulation in this world but the man who is giver over to the will of God bears tribulation easily, seeing it but putting his trust in the Lord, and so his tribulations pass." "There are three things I cannot take in: nondogmatic faith, nonecclesiological Christianity and nonascetic Christianity. These three - the church, dogma, and asceticism - constitute one single life for me." - Letter to D. Balfour, August 21, 1945. "If one rejects the Orthodox creed and the eastern ascetic experience of life in Christ, which has been acquired throughout the centuries, then Orthodox culture would be left with nothing but the Greek minor [key] and Russian tetraphony." - Letter to D. Balfour. "There are known instances when Blessed Staretz Silouan in prayer beheld something remote as though it were happening close by; when he saw into someone's future, or when profound secrets of the human soul were revealed to him. There are many people still alive who can bear witness to this in their own case but he himself never aspired to it and never accorded much significance to it. His soul was totally engulfed in compassion for the world. He concentrated himself utterly on prayer for the world, and in his spiritual life prized this love above all else." -- St Silouan the Athonite, p.228. Interview with Archimandrite Hierotheos on Elder Sophrony, excerpt from Divine Ascent. This page was last edited on November 26, 2012, at 20:44. This page has been accessed 78,275 times.